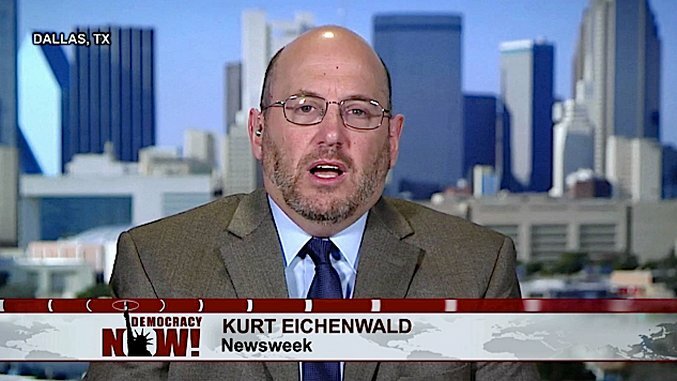 Did Kurt Eichenwald Cost Jim Impoco His Job at Newsweek? On Tuesday, it was announced that Newsweek’s Editor in Chief and principal Kurt Eichenwald enabler, Jim Impoco, would be stepping down in a reorganization effort by parent company IBT Media. Jim literally brought this iconic brand back to life and in many ways it is better than it has ever been. His commitment to the highest standards of journalism, his sharp eye for great narrative stories and his knack for hiring fantastic writers have made him a legend in the news business. He leaves an inspiring legacy at Newsweek that we will work hard to maintain. Sentimentality aside, however, Impoco’s departure raises several questions. Financially speaking, he was an asset, having gotten Newsweek through a rough period, according to all measures. As Politico noted, it was abrupt—there is no replacement for the London editor who is set to take over his post—and it sent shockwaves through the staff. Though this could simply be a reorganization as Pragad claimed, it comes on the heels of IBT Media being served with a lawsuit by one William Moran, formerly of Sputnik, over misleading reporting by Newsweek senior writer Kurt Eichenwald, which Paste covered at the time. This occurred on the 9th, just days before the announcement. As our readers may know already, Eichenwald has had a long leash on Impoco’s watch. On more than one occasion, his claims and reporting have been seriously called into question. Paste has noted the way the Newsweek reporter often appears to cite anonymous sources to cover for his own opinions, and makes odd, unverified statements. For example, since 2014, he has asserted that in 2001, he was exposed to anthrax and required treatment. However, his account of the situation has varied, prompting many to question its veracity. @bobbotwit And i say the cowardice thing as someone who was in vicinity of an anthrax attack in 2001, shrugged my shoulders and took cipro. I saw crushed bodies from 9/11. I was exposed to anthrax & needed cipro. Ive been threatened by a terrorist. I'm not scared. USA: Calm down. Just FYI…I shorthanded it. I did not take Cipro, med of choice 4 anthrax. Cipro affects anticonvulsants. So had to take second line drug. @JackieGlo305 I was at ground zero. I was exposed to anthrax, needed meds. A terrorist told me he wanted to kill me. Yet ur afraid & Im not. According to CNN, over 32,000 people took antibiotics after possible exposure to anthrax, so this claim is hard to verify one way or another. Paste has submitted a FOIA request to acquire this list. Then in October, the incident with Bill Moran occurred. To recap, in 2012, Clinton-ally Sidney Blumenthal sent John Podesta an article written by Eichenwald about Benghazi in which the Newsweek journalist argued that because the incident had happened on then-Secretary Hillary Clinton's watch the GOP had a legitimate grievance about her leadership. Fast forward to 2016 with Wikileaks dumping Podesta's emails, came a rush to find big news. A Twitter user found the email from Blumenthal, and excerpted the quote about Benghazi and attributed it to Blumenthal. Then-Sputnik writer, Moran, saw the tweet, verified the link to the email, and dashed off a “bombshell” piece. Although the piece was only live for 20 minutes before Moran, realizing his mistake, took it down, the news had reached Donald Trump who quoted it in a speech. The glory was short-lived however, as Moran tried to alert both Newsweek and Eichenwald of what had actually happened. In response, the award-winning journalist tried to coerce the young, American-born Sputnik writer into silence over the phone and by email, offering to provide a recommendation and assistance in getting a job at New Republic, and threatening to destroy his career should he go public. In November, Paste found another Eichenwald article that warranted correction titled, “The myths Democrats swallowed that cost them the presidential election.” Citing anonymous sources, he claimed to have had exclusive access to the GOP's opposition research dossier on Senator Bernie Sanders. This file, he argued, was two-feet thick and contained new information which would have completely undermined the Vermont Senator's campaign in a general election. However, as journalist Andrew Perez pointed out, everything in Eichenwald's piece had previously been reported during the primary, which cast doubt over his supposed access. However, when Carlson asked what the message was, Eichenwald would not answer. Instead he accused the host of ignoring their sacrifice. Presumably, he was working his way around to calling Trump a Russian plant? Following the segment, another controversy erupted when Eichenwald took to Twitter claiming that he had been the victim of an attack by a “deplorable” who, aware of his epilepsy, had sent him a flashing gif. Although it is certainly possible that such an incident occurred, we at Paste will wait to see if there is indeed a lawsuit filed. Throughout all of these incidents—any one of which could have justifiably ended the career of the reporter involved—Jim Impoco stood by Eichenwald, going so far as to attack those who questioned him. Following our piece on the Moran incident, he even got into it with us, calling the narrative that his reporter used coercion “ridiculous.” Paste reached out to IBT Media to find out if Eichenwald's behavior played any role in Impoco's dismissal. Mark Lappin, Newsweek's Director of Communications, simply said that the move was unrelated to Moran's lawsuit, and directed us to the statement provided by Pragad to Yahoo News. No further comments were provided. If Impoco's dismissal was Eichenwald-related, it wouldn't be the first time the troubled reporter cost his editor his job. The two were colleagues at the now-defunct Portfolio business magazine in the mid 2000's. According to The New York Times, Impoco engaged in a heated disagreement with his boss, Joanne Lipman, about Eichenwald. The incident allegedly contributed to his firing. Recently, they have differed on the handling of Kurt Eichenwald, an investigative reporter who has admitted to giving money to a person he later wrote about while he was at The New York Times—a violation of generally accepted journalistic ethics. People at the magazine say that was just one conflict among many. We may never know for certain the circumstances surrounding his departure from Newsweek. Whatever they were, we at Paste wish Mr. Impoco well. Still, not everyone was sad to see him go. Mr. Impoco would not speak to Paste on the record. Paste was contacted by Kurt Eichenwald who would only speak off the record. We have offered him an opportunity to rebut this article. Thus far he has declined to do so.